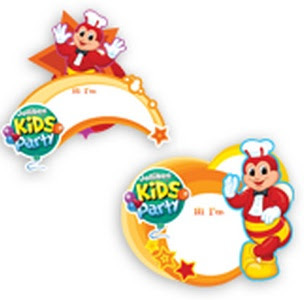 The last item for this series is the “My Bestfriend Jollibee” theme for Jollibee party package. This birthday theme is perfect for the ultimate Jollibee fanatic. If your son always wants to have a photo taken with a statue of Jollibee then you must select this party theme for his birthday party. Jollibee is the focus of this birthday theme. 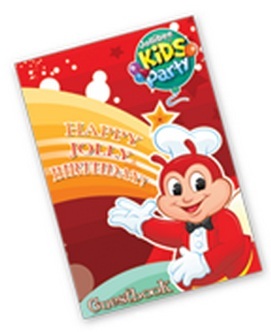 The party items for this Jollibee party package includes invitation cards, tray liners, party hats, loot bags name tags and a guest book. Jollibee will show up in this birthday theme and, surely, the fans of the jolly mascot will enjoy watch his antics or play with him. My Bestfriend Jollibee themed invitation cards. My Bestfriend Jollibee themed tray liners. My Bestfriend Jollibee themed party hats. My Bestfriend Jollibee loot bags. My Bestfriend Jollibee name tags. Read about the party items for other Jollibee party package themes like the Barbie theme and the Jollitown theme. Here is the guide in choosing the best Jollibee party package for you. Do you have any question about preparing for a Jollibee party? Tell us your questions by leaving a comment. Tanong q LNG po if pwedeng ung worth ng cake add nlng sa food.coz we will bring our own cake...?? I suggest that you ask Jollibee regarding their rules sa pagpapasok ng pagkain from the outside. Posible po na may mga restrictions. Hi pde minnions ang theme? Sorry po, pero walang Minions theme ang Jollibee. I suggest na mag-DIY na lang kayo ng party para makapag-minions theme kayo.